There's good news and bad news on the freshwater fishing front. The good news of course is that the cooler, rainier and unseasonal weather has been kind to trout in both islands. The bad news of course is that these conditions make frustrating angling but things can only get better. And there are plenty of positives! 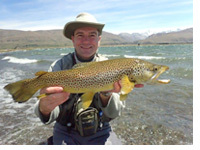 Some of the "best angling and best fish for many years” has come from Canterbury high country lakes this season. Salmon are being caught on the Hurunui river and also further south at Lake Hawea and the upper Clutha River, and some sea-run salmon have already been landed at the West Coast's Lake Mapourika (West Coast runs usually happen later in the season). In the central North Island, there are stories of "multiple trout gulping flies off the surface” from the Whakapapa and Whanganui rivers in the late evening. Lake Rotorua fish are in "solid” condition, possibly the best shape for around a decade, according to one F&G staffer. And our staff tell of "plenty of fat trout” in Taranaki streams, when you brave the rugged weather. P.S. - This month's cover pic shows Bert Berger from Belgium with a lovely brown from the South Island's Lake Heron – on his 9th trip to NZ! P.P.S - If you think you've got a freshwater fishing image worthy of featuring on our 'cover', email it to Richard Cosgrove for consideration. This Month's Regional News Click on the region to read. Dirty rivers have been making headlines yet again. Aerial photos taken by Fish & Game have showcased the scale of pollution on Lake Forsyth which has become toxic once more. The Canterbury lake has been subjected to toxic algal blooms since at least 1907, but they have become increasingly severe in recent years. A toxic algae warning was recently placed on the lake. For details click here. Water is increasingly becoming a high profile issue in 2017, and is gaining traction in metropolitan centres. With an election looming, political commentators are starting to highlight water quality as a topic that political parties must address. Writing on the web news site The Spinoff, prominent journalist Simon Wilson's political column lists key election issues in what he describes as National's Index of Shame Details here. (Pictured is the heavily polluted Selwyn River in the South Island). Fish & Game has saluted the efforts of an individual dairy farmer determined to cut his farm's discharges. Dairy farmer Phil Musson's 'can do' attitude has won him the annual Working with Nature environment award from North Canterbury Fish & Game. He's been recognised for his efforts to change his farming practices to make them more sustainable and environmentally friendly, while still farming profitably. Read here. 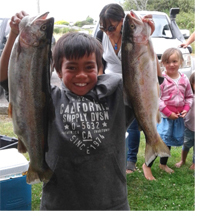 When anglers manage to get out in the tricky weather conditions, Lake Rotorua's producing some "top notch” trout. Fish & Game officers say the shoreline fishery that focuses mainly on stream mouths has been slow to get underway this summer, due to cooler and windier than normal conditions. But the trout caught have been in "solid condition.” Some hefty fish have also been caught in other lakes. One was a superb 5.5kg (12lb) 67.5cm rainbow caught jigging on Lake Rotoiti. Read more here. Many of our rivers have low numbers of trout and are not suited to the beginner angler. Martin Langlands advises anglers to seek out local rivers with moderate numbers of small to average-sized fish and spend time on them to build up your confidence and skill levels. His second tip is to try using black or dull-coloured dry flies. For details click here. The 'Hannibal Lecter' of the trout world! 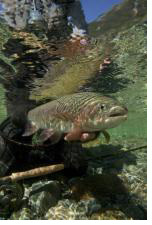 Central South Island Region Field Officer Rhys Adam's encounter with a cannibal trout was picked up by mainstream media after his account was published in the CSI's Weekly Fishing Report. If you are curious about what a greedy 60cm trout eats click on the link here. 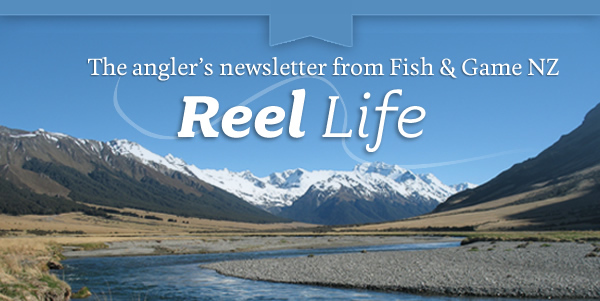 If you would like to advertise in the above banner position and directly reach the fishing community across New Zealand, please contact Don Rood. It was the scent of lilies that brought back memories. Heavy on the air in the stillness of evening, it clung to the valleys and ditches bordering the river – a night scent masking the ordure odours of streamside paddocks. The wind had died and the trees were at rest, shattered leaves hanging limp from storm-battered branches. Willows dragged in the water from broken trunks, too brittle to withstand the gales. A chorus of birdsong replaced the shriek of wind, and they flew to roost in tall refuge, darkly fluttering in a vermilion sunset. Red-beaked gulls followed the path of the river, upstream from the sea. They flew low, silent, ghostly white, going to a gathering in a paddock, bellies and crops fish-laden.